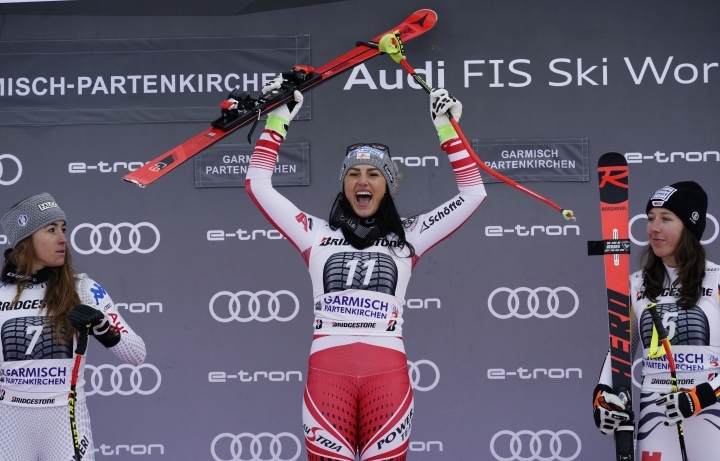 GARMISCH-PARTENKIRCHEN, Germany — Austrian skier Stephanie Venier edged Olympic champion Sofia Goggia to win her first World Cup in a crash-interrupted downhill race that was ended early on Sunday. The race finished with 10 skiers still waiting to descend the Kandahar course after Federica Sosio became the seventh competitor to crash after a jump. The 24-year-old Sosio was taken to the local hospital by helicopter. The Italian team said Sosio suffered a broken left leg. Federica Brignone, another to crash at the same spot, was also hospitalized but tests showed no damage to her right knee. Goggia said her own successful return from injury was overshadowed by Sosio's injury. "One of my teammates got injured so I have lots of emotions. One is my result, my performance, and the pain and the sadness from this crash," Goggia said. "It's always sad." 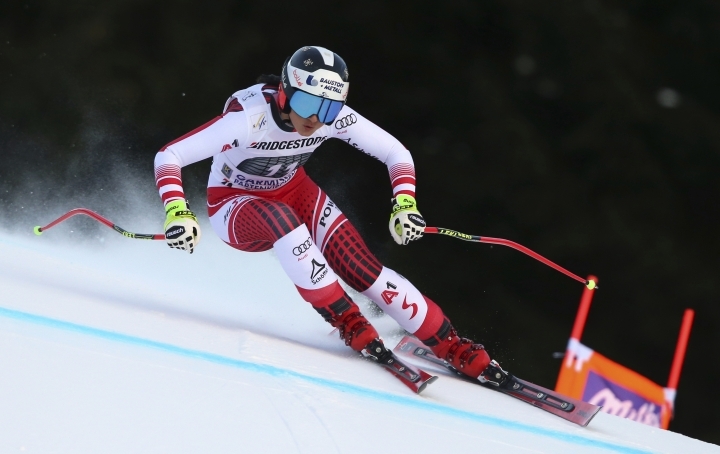 Venier finished 0.25 seconds quicker than Goggia, who was also second in Saturday's super-G. Goggia was competing for the first time since she broke a bone in her right ankle while training in October. "I came here to Garmisch and wanted to take a step forward in relation to my ankle — also with a view to the upcoming world championships. It's not good to set expectations too high. I knew how it felt going into every turn," said Goggia, who only returned to training around two weeks ago. "I'm happy with the progress I made." Kira Weidle delighted home fans by finishing third, 0.54 seconds behind. She was ahead of Swiss skier Corinne Suter, who was fastest in the first training run Thursday, and Slovenia's Ilka Stuhec, who will defend her world title in downhill at the world championships in Are, Sweden next month. 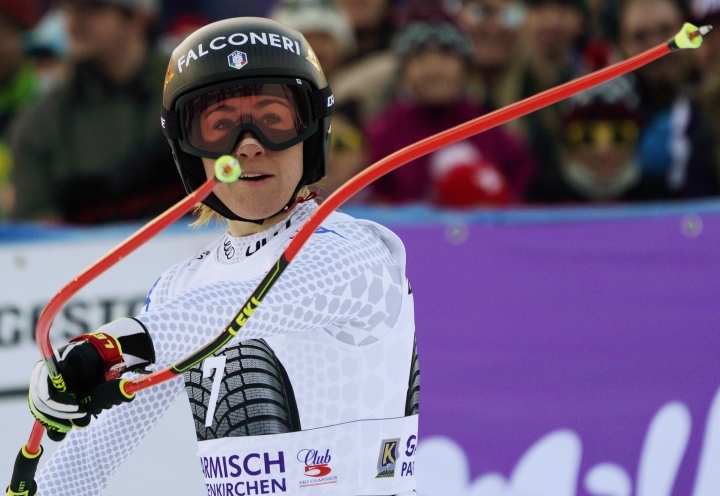 Venier was third in a downhill at Cortina D'Ampezzo, Italy the previous weekend. "I felt very good today. I was very relaxed at the start, the flat upper part was very agreeable and the jump went very far. I actually had nothing to lose," the 25-year-old Venier said. "I never thought I'd finish ahead of Sofia Goggia." 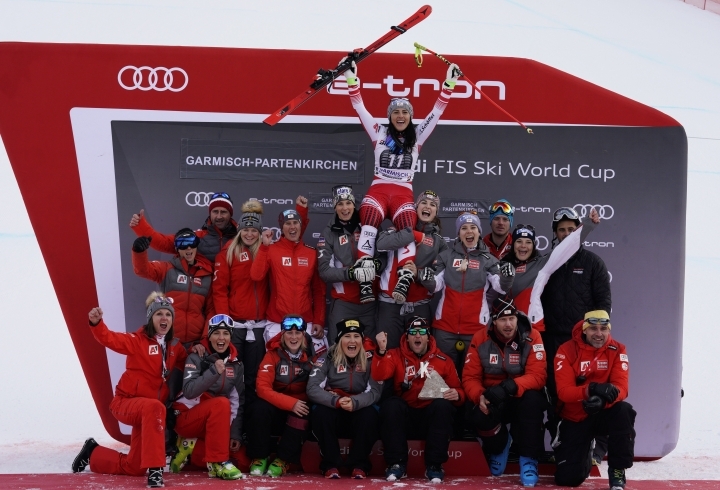 There was disappointment for Venier's teammates Ramona Siebenhofer, who had been going for her third consecutive downhill win after back-to-back victories in Cortina, and Nicole Schmidhofer, going for her third win of the season. Schmidhofer, who won Saturday's super-G, finished seventh, 1.03 seconds slower than Venier, with Siebenhofer 1.37 off the pace. It was worse still for their teammate Cornelia Huetter, who was one of the first to crash off the course spectacularly, leading to a lengthy delay. The Austrian team said Huetter suffered a torn ligament in her right knee and a muscle tear in her left calf, ruling her out of the worlds. She had just returned from a five-week injury layoff. Italy's Nicol Delago set the tone for the race when she crashed wearing the No. 1 bib. Overall World Cup leader Mikaela Shiffrin skipped the weekend's races and was planning a return in Maribor, Slovenia next weekend before the world championships. Lindsey Vonn also took a break to give her troublesome knee injury a chance to recover. Vonn had hinted at immediate retirement after failing to finish a super-G in Cortina the previous Sunday.